Aura returns home from university to her mother's Manhattan loft with a useless film theory degree, 357 hits on her YouTube page, a boyfriend who's left her to find himself, a dying hamster and her tail between her legs. She quickly careens into her old/new life, taking the audience on a wildly imaginative ride through romantic humiliation and post-university confusion. Tiny Furniture is the breakout film by one of America's youngest female talents, 25-year director-writer-actor Lena Dunham, and made its world premiere at the 2010 South-by-Southwest Film Festival, where it won the Jury Award for Best Narrative Feature and Dunham took home the festival's breakout award for emerging narrative woman director. The film has garnered Dunham comparisons to the likes of filmmaker Miranda July and comedian Tina Fey, as well as the hit series Seinfeld. She has been hailed as "the Woody Allen of Generation Y" by Screen International and the "future of screen comedy" by Total Film. 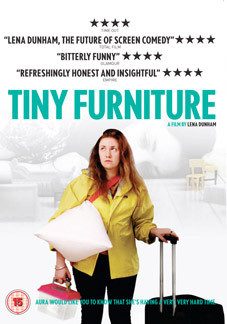 Already enjoying cult status in the US, critical acclaim in the UK and securing Dunham her own HBO television series (Girls), Tiny Furniture will be released on UK DVD and Video on Demand by Independent Distribution on 28th May 2012 at the RRP of £15.99.